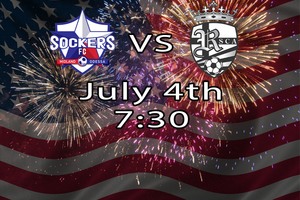 Sockers FC take on the Houston Regals SCA this Wednesday, July 4th, at 7:30pm. Be sure to stay afterwords for an amazing July 4th fireworks show spectaculer. With a win Sockers FC can clinch a home game for July 7th playoffs. Cheer on your Sockers FC with July 4th Fireworks!